Although the contest is over, you could still learn about kite design and activities. See below for links and other relevant information. See the archived Kite Broadcast of the event. one for grades K-4 and one for grades 5-8. Contests - August 20 and September 7, 2001.
from the Glenn Hangar and have their kites hung at the Glenn Visitor Center. Minnesota, Wisconsin, Michigan, Ohio, Illinois, & Indiana. 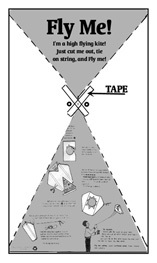 After receiving your kite, follow the instructions below. 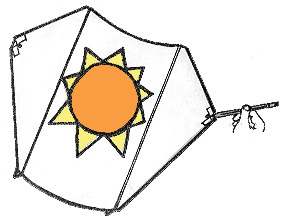 Pay particular attention to step two: coloring your kite. You will want to put some effort into this step as the kites are being judged on their design merit. In case you need to obtain the bags used in this design from another source they are 14" x 211/2" in size and are standard white department store bags. Also included here are Pre-Activity Questions that can be posed to your class. Click here for Answers. In 1896 the death of German Glider pilot Otto Lillienthal sparked an interest in flying for Wilbur Wright. By 1899, he had read just about everything on aeronautics that was available at the time. By observing birds in flight Wilbur realized that a flying machine would have to have wings to provide lift and a mechanism to control it as well. With his brother Orville, Wilbur built a kite to experiment with theories of lift and drag. To control the motion of the kite, they used wing warping or twisting of the wings using cables. To read more about the Wright Brothers' Process of Invention and their path to flight, you can visit the Wright Brothers Centennial of Flight Site. Below are listed some links that may give you some ideas for designing your kite, as well as help troubleshoot any problems you may encounter while building and/or flying your kite. For any further assistance or questions you can email Tom Benson. 1) Tape an "X" as shown to reinforce the holes. 2) Color or decorate outside of bag with crayons, markers, or paints. 3) Cut off top corners and entire bottom of bag along solid dashed lines. Hold bag open and remove grey areas by cutting along open dashed lines (on this side of bag only). Fold "wings" outward. 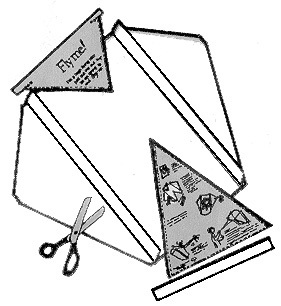 4)Turn kite over (stiffeners on back). Punch out bridle holes at wingtips with sharp pencil, ballpoint pen, or hole-punch. Stand with the wind at your back. Hold kite out at arm's length and toss it into the air. Let out line as the wind takes the kite, pull the line to make the kite climb. Fly safely: avoid overhead wires, trees, streets, and airports. 5)Cut a 6-foot length of string for a "bridle." Tie each end of the bridle string to a bridle hole. Hold the wing tips together, stretch out line, find the exact center of the bridle, and tie an overhand knot at the center to form a loop. 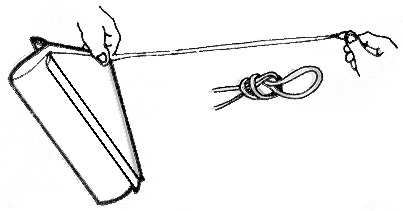 Tie flying line to loop. 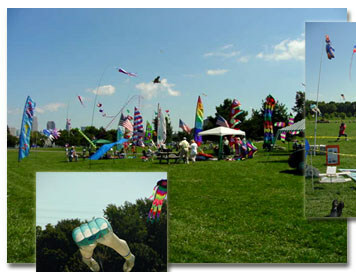 The photos are from OSEK's KiteFestival 2001 held at Edgewater Park Sept. 15 & 16. We would like to thank them for supplying the source of the kite design used in this contest.